Over the weekend I hosted a holiday party for my friends. As much as I love hosting parties and try to get as much prep done as I can, the morning of is always a bit chaotic. The combination of a 400° oven that's been on since 8 a.m. while rushing around getting the house and myself ready is more than enough to make me break out in a sweat, and the last thing I want to worry about when I'm greeting my guests is whether or not my deodorant is holding up! For this occasion, Dove invited me to try their new Dry Spray Antiperspirant. Like the name implies, when you spray it on it dries instantly. I was truly impressed by this, as I've never found that quality in a spray deodorant before; I could just shake, spray and go! Perfect because I just barely made it into my dress and heels before guests started to arrive. In the past I've loved Dove's products for their signature 1/4 moisturizing technology and the Dove Dry Spray Antiperspirant is no different, my skin feels so soft and dry after using it. Dove promises 48 hours of odor and wetness protection, and while I didn't do a full two day experiment, I can honestly say that by the time I saw my last guest off and finished my party clean up, I was still feeling fresh. Big goodbye hugs for everyone! And yes, it is 100% little black dress approved. Not a single white mark to be seen! I even tested it by spraying directly on a black tee I was going to be laundering anyway, and the spray was completely clear. 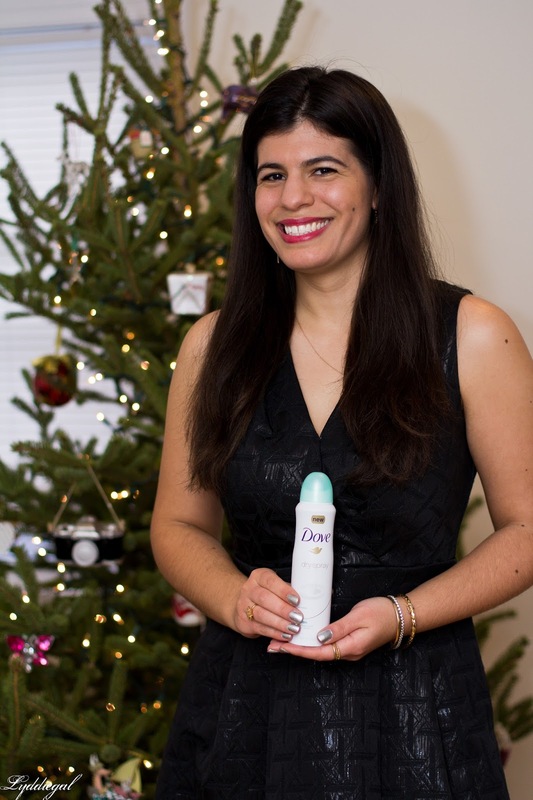 Having spent too many occasions with my arms awkwardly down, Dove Dry Spray Antiperspirant is officially part of my holiday party survival kit. Make sure you've got a detailed list of all the food you are serving and go over it once before the party starts and one more time during - completely forgetting about an appetizer in the fridge or leaving a cheese off the cheese plate is no fun. When entertaining in close quarters, try to stick to appetizers and finger foods, if some of your guests will have standing room only, they will appreciate being able to easily eat, hold on to their drink and still be able to mingle. Plan at least a few party games, especially if your guest don't all know each other. I planned a Yankee Swap where I bought all the gifts so there were no hard feelings and it was a lot of fun. Other party hits are Apples to Apples and Taboo. Use Dove Dry Spray Antiperspirant to get ready in a flash and feel fresh all night. Woohoo for Dove coming to the rescue!!! And yep, those are some pretty solid tips. Leaving tasty food in the fridge is always so sad!! I use Dove - have been for ages - but never the spray. Oh crap, I have forgotten about items I was supposed to serve and had them for breakfast, lunch and dinner the day after. It was not that bad. I actually keep this spray on me for touch-ups on particularly rush-rush-rush days- it's a great deodorant! I have never used this product, but it seems like a no brainer! Great party tips and lovely post! I love this stuff! It's GREAT and I am super happy you got to work on this campaign! Go you! These are all such great tips! Dove really makes quality products. I am such a fan of their shampoo and conditioner! Such great tips!! and I love that Dove spray! Sounds like this Dove spray was a lifesaver!! I've never tried spray deodorant before but am curious to try it now! Hmm, might need to try. I'm constantly fighting the sweat situation in general, and particularly in florida! I have been using their roll on versions of deodorants, absolutely love them! Will give this one a try soon. I love Dove products, so I need to try this antiperspirant spray! Loving your party tips too! Dove dry spray is one of my favorites! Love that it doesnt get on your clothes! Great party tips!! And the dove spray looks great! Dove deoderant is totally my fave! Love! I use their antiperspirant all the time! It's really good and doesn't leave a mess.